My new pastime: double exposures, inspired largely by British photographer Kevin Meredith who recommended the iOS free app, Dubble. There you can "collaborate" with other photographers—you contribute one photo, which will be superimposed on a photo (called a "single") taken by someone else. 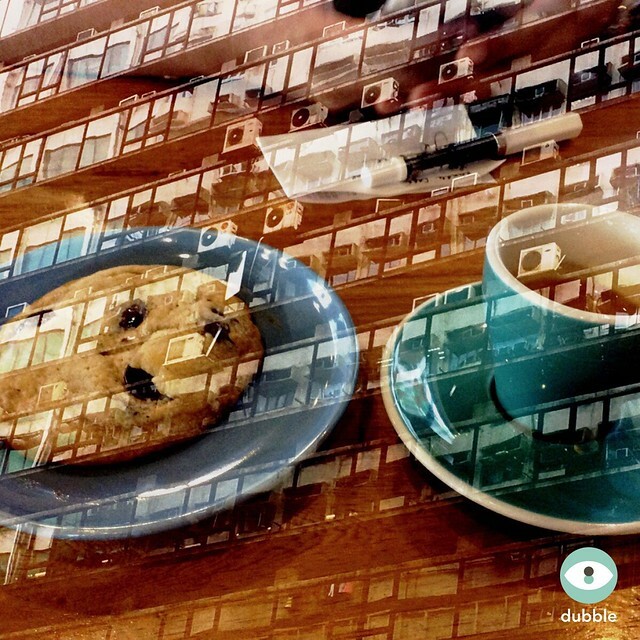 Here's my cookie photo superimposed on hkdonnie's building. My TWSBI Eco floats in the background. If you want to generate double exposures using both your photos, use Studio MX. The free version doesn't let you save photos, but you can export or upload them to social media, notably Instagram. Here are some of mine. Flowers along Diversion Road to General Santos City Airport + clouds over Sarangani Bay taken from a Cebu Pacific airplane. Decrepit bahay kubo + wild grass, General Santos City. The final photo shows me floating just near the shore, when I'm so far from it.